Slash is feeling like a man without a country right now. Working on his first-ever solo album, the Velvet Revolver guitarist says, "I'm totally on my own." During a recent interview with Rolling Stone, Slash revealed that making his solo album has been "cathartic. I'm used to a band situation where I'm one fifth of the input no matter who brought the song or whatever it is. "Every band I've ever been in we all just sort of tear it apart, put it back together, and it comes out however it comes out. This is interesting for me because I'm just doing my thing and I have no one to answer to." Slash admitted that he will bring in different singers for every song, although he wouldn't name names. "There's a wish list and so far I've managed to get pretty much everybody on that wish list to commit," he said. "At the pace the Velvet Revolver singer search is going I'll probably get this done before then." When asked who he would like to see on an upcoming version of Guitar Hero, Slash said, "Cheap Trick would be cool; Judas Priest would be cool. The James Gang would be cool. I'm sure an Yngwie Malmsteen record would be sort of cool. It would be definitely a Guitar Hero exercise. "You have to understand how the game works and what band really fits in to that, because you have to be able to do something interesting with the fingers, so it can't be anything overly simple. It's gotta have some sort of involvement as far as chord changes and solos. AC/DC is probably the top one. They don't need the boost, but that would be the top one. That's really the ultimate guitar-driven band when it comes down to it." 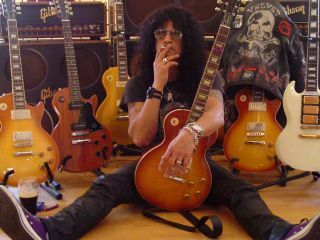 Slash was also asked when he realized that Guns N' Roses were having a sizable impact on fans. "I think the first time I ever really saw how that clicked was when the Paradise City video came out. There's this couple in Guns N' Roses T-shirts somewhere in the first 10 rows. There's a close-up of them making out, just a quick shot, and that hit a nerve with me 'cause that took me back to when I used to be putting my hand up some girl's shirt in the heat of the rock concert. "I met that chick by the way, years later. But lately it's just been a lot of people talking about certain moments that they've had listening to a particular song or whatever. But I can relate to it, I know exactly what they're talking about because all those things you go through in life as a teenager, usually to the background music of some great band that you're into. It's very important, the rock 'n' roll colorizing of the whole thing; you start looking at people's experiences like that." To hear Slash talk so wistfully about Guns N' Roses, it makes us wonder if Axl really will be the next Velvet Revolver singer.Time will tell.